=Finally, the final part of Chae Jemin’s Star’s Diary. I specially post this one today coz it happens to be Jemin Oppa’s birthday~ Happy Birthday, Jemin Oppa! 제민오빠 생일 축하드려요~^^~~ Check out the complete version here. 채제민은 정이 많다. 대상은 다양하다. 가족, 친구들, 부활. 그리고 25년을 함께한 드럼스틱. 음악의 길을 후회한 적은 없다. 오히려 시간이 흐를수록 애착은 더 짙어졌다. 인생을 모두 쏟은 만큼 자부심도 생겼다. Chae Jemin is very affectionate. His affection goes to many people. Family, friends, Boohwal. The drumsticks that’s been with him for 25 years. Never once he regretted his choice to do music. On contrary, he feels more attachment to music as time goes by. His pride grows as much as he’s poured (hard work) in his life. 사실 드럼은 화려하지 않다. 늘 무대 뒤를 맡는다. 주목하는 눈도 적다. 밴드 녹음에서는 간혹 다른 연주가로 대체되기까지 한다. 티삼스 앨범 때가 그랬다. 소속사는 실력 부족을 이유로 따로 연주가를 섭외했다. 주인공은 문영배. 사랑과 평화, 신중현 등과 함께 일한 베테랑이었다. 채제민은 자존심이 상했다. 가짜 녹음을 받아들일 수 없었다. 시작부터 흔들린 기둥. 결과는 불 보듯 뻔했다. In reality, the drum is not glamorous. It’s always on the back of the stage. Only so many people give attention to it. Worse, in band recording, drummer position could be replaced. That’s how it was when he recorded Tisams Album. Their production company said that his skills weren’t good enough so they invited other drummer. The drummer was Moon Young-Bae. A veteran whose worked with “Love and Peace,” “Sin Jung-Hyeon,” and other great musicians. Chae Jemin’s self-esteem was hurt. He couldn’t take the fake recording. A shaking pillar, from the beginning. The result was as clear as the daylight. 티삼스 해체 뒤 채제민은 눈앞이 캄캄했다. 막막함은 이내 방황으로 이어졌다. 올바른 연주가의 삶을 알려줄 길잡이가 필요했다. 한참을 해매이다 그는 문영배의 연습실을 찾아갔다. 진정한 연주가로 거듭나고 싶은 마음에 무턱대고 제자를 자청했다. 허드렛일도 마다하지 않은 수하생활의 시작. 그렇게 시간은 4년이 흘러갔다. After Tisams broke up, Chae Jemin saw only darkness in his future. The frustration led him to wander. He needed to find out how he could live a life of a musician. After wandering around for quite a while, he looked for Moon Young-Bae in his studio. He wants to become a real musician, thus he asked for Moon to take him as his student. He started a life being a chore boy who’d do all odd jobs. 4 years went by that way. 채제민은 가르침을 다음 세대에 전달한다. 소통 수단은 다양하다. 개인 레슨, 학원 강의, 공연. 가장 강한 애착은 인터넷 강의다. 인터넷사이트 ‘스쿨뮤직’을 통해 국내 최초로 동영상 드럼 교육을 선보였다. 시작 당시 환경은 열악했다. 친분을 통해 겨우 서버를 확보했다. 영상 제작도 모두 혼자 해결해야 했다. Chae Jemin transfers the teaching to the next generations through various means. Private lesson, music school, concerts. He enjoys teaching online music school. 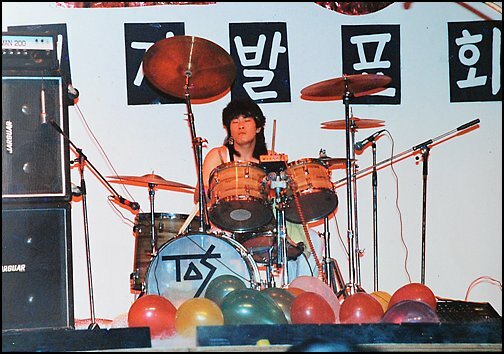 He was the first person to teach drum by video-lesson in Korea through an internet site “School Music”. The situation was really poor when he started. He could finally secure the server thanks to a close person’s assistance. He also produced all of the videos by himself. 교육활동은 지금도 계속된다. 대학 강단에서 실용음악을 가르친다. 학교의 기대치는 현장 학습 등의 실습 수준. 그러나 채제민은 틈틈이 이론을 정리하며 공부에 매진한다. 그래야만 올바른 교육을 할 수 있다는 신념 때문이다. He keeps this teaching activity even until now. He teaches applicable music in university lectures. He gives concert training that wasn’t applied in campuses before. But Chae Je Min always devote his spare time to gather all theories for his teaching material. Because he believes that it’s the right way to educate. 교육에서 가장 중요하게 여기는 건 즐거움. 학생들이 스스로 선택한 음악에서 흥미를 찾도록 도와준다. 사실 음악계 사정은 좋지 않다. 졸업생 가운데 10%정도만이 음악을 이어나간다. 현장에서 뛰는 음악가로 그는 책임을 통감한다. 제자들에게 미안함을 느낀다. 교편을 잡았지만 그는 잘 알고 있다. 대한민국에서 연주가의 길이 얼마나 험난한 지를. To him, in education, the most important thing is “joy.” He helps his students find what they like from the music they choose. In reality, the condition of the music industry is not good. Among his graduated students, approximately only 10% continues doing music. He feels strongly responsible as a person who is doing music right on stage. He feels sorry to his students. Although he teaches, he knows fairly well. How rough the path to be a musician is in the Republic of Korea. 25년의 때가 묻은 드럼스틱. 그에게도 힘든 시간은 숱하게 있었다. 지금껏 견뎌낸 건 모두 밴드 덕이었다. 조직이 주는 유대감과 책임감이 음악을 계속 할 수 있는 원동력으로 작용했다. The drumsticks that’s been with him for 25 years. It also went through so many difficult times. It’s all thanks to the band that he could make it up to now. The feeling of fellowship and responsibility given by an organization, comes to be a driving force that keep him doing music. 채제민 역시 영원한 부활멤버를 꿈꾼다. 부활은 어느덧 가족 같은 존재가 됐다. 항상 화목하진 않았지만 편안하고 정이 넘친다. 앞으로 가야 할 길이 두렵지 않을 만큼 든든하기까지 하다. 그는 믿는다. 인생 마지막까지 부활과 함께 할 것이라고. 그래서 묵묵히 집은 드럼스틱은 오늘도 가볍게만 느껴진다. Chae Je Min, he dreams to eternally be Boohwal member. Somewhere along the way, Boohwal becomes a family. It’s not always harmonious, but it’s comfortable and he has overflowing attachment to it. He does not fear to walk the path before him, he’s reassured. He has faith. That he will always be with Boohwal until the end. That’s why the silent drumstick feels so light. 채제민(왼쪽)이 함께 공연한 김장훈과 포즈를 취하고 있다. 채제민(오른쪽)이 부활로 함께 콘서트 무대에 선 이승철과 포즈를 취하고 있다. 1999년 여름. 채제민은 착잡했다. 답답한 심경은 편지지에 옮겨졌다. 미안함 묻은 서정적인 문장들. 수신자는 부활의 리더 김태원이었다. 편지봉투를 만지작거리다 그는 한숨을 내쉬었다. 부활 탈퇴에 대한 이해를 구하는 내용의 편지. 결정은 자의가 아니었다. 편지 두 번째 구절처럼 어쩔 수가 없었다. Summer 1999. Chae Jemin was in dilemma. He transfered his frustration into a letter. Lyrical sentences filled with apologies. The recipient was Boohwal’s leader, Kim Tae-Won. Fiddling the envelop in his hands, he took a deep breath. The letter was to ask for understanding about his leaving from Boohwal. It was not a voluntary decision. Just as it was written in the second paragraph of the letter, he had no other way. 채제민은 여섯 번째 앨범부터 부활에 합류했다. 연주가로 활동하던 중 받은 최승찬의 제의가 계기가 됐다. 최승찬은 조용필 밴드인 위대한 탄생 등에서 키보드 등을 담당한 부활의 원년 멤버다. 티삼스 뒤 다시 들어가게 된 밴드. 채제민의 마음은 설레었다. Chae Jemin joined Boohwal from the 6th album. While performing as (session) musician, an offer from Choi Seung-Chan opened a door of opportunity. Choi Seung-Chan was originally Boohwal member who played also played the piano for Jo Yong-Phil’s band “위대한 탄생”. A band that he finally joins again after Tisams. Chae Jemin feels his heart flutters. “After Tisams, his Senior Mun Yeong-Bae always emphasized, ‘a drummer should be in a band.’ I would have never dreamed that the opportunity would be Boohwal. 부푼 기대로 시작한 밴드. 그러나 앞날은 순탄치 않았다. 부진한 앨범 판매 탓은 아니었다. 멤버 사이 갈등이 심화됐다. 김태원과 최승찬이 자주 의견충돌을 빚었다. 다툼은 오래가지 않아 결국 사단이 났다. 최승찬이 멤버들과 함께 팀을 탈퇴했다. 채제민도 무리에 포함됐다. He joined the band with a big hope. However, the days in front of him was not so smooth. It was not because of the stagnant album (unpopular). There was a deepening conflict among the members. Kim Tae-Won and Choi Seung-Chan were often in disagreement with each other. The arguments didn’t last for long but in the end the team was divided. Choi Seung-Chan together with the rest of the team left Boohwal. Chae Jemin was included. 보컬 김기연마저 성대결절로 이탈한 부활. 남은 건 김태원뿐이었다. 채제민은 괴로웠다. 함께 한 리더에게 상처를 줬다는 자책감이 지워지지 않았다. 미안한 마음에 학교 다닐 때도 잡지 않던 펜을 집어 들었다. 본심을 편지에 써내려갔다. Even vocalist Kim Ki-Yeon left the band, and Boohwal was left with no voice at all. Kim Tae-Won was the only member left. Chae Jemin was agonized. He can’t erase the guilt feeling that he had given a scar to the leader he had been with. On his guilt, he grabbed on a pen that he didn’t even touched during his school days. He poured in his true feelings to a lettter. 부활을 나온 뒤 채제민은 많은 공연과 앨범에 연주가로 참여했다. 이승환, 이승철, 신승훈, 변진섭, 박효신, 윤종신, 포지션, 김범수, GOD…. 가장 기억에 남는 건 이선희다. 공연이 지루해질 것을 우려해 콘서트에 연주가들의 차력 쇼를 넣었다. 도사 가발을 쓰고 벽돌을 깨며 드럼을 쳐야 했다. 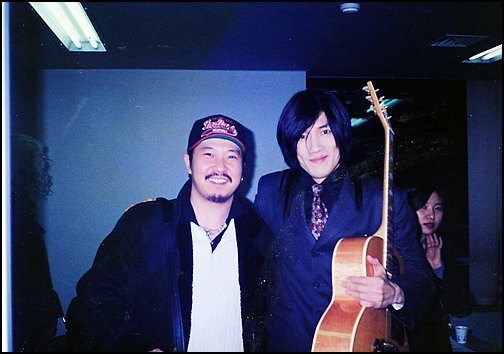 After leaving Boohwal, Chae Jemin participated in various concerts and albums as session musician. Lee Seung-Hwan, Lee Seung-Cheol, Sin Seung-Hoon, Byeon Jin-Seob, Park Hyo-Sin, Yun Jong-Sin, Pho-Jisyeon, Kim Beom-Soo, GOD… the one he remembers the most was Lee Seon-Hee. Worried that he’d get bored with the concerts, the musicians put him on a strength show. Putting a synthetic wig on, he had to play the drum while breaking bricks. 물론 이보다 수월한 공연이 더 많았다. 헤드윅과 같은 뮤지컬에서는 배우들의 대사가 절반 이상인 까닭에 틈틈이 새우잠을 청하기도 했다. 다양한 공연과 음반 참여. 주머니는 넉넉해졌다. 그러나 마음 한 구석은 늘 허전했다. 이전부터 변하지 않던 바람. 밴드를 향한 열망 때문이었다. Of course there were easier concerts. In musicals like Hedwig, the artists’ lines take more than half of the performance he’d even ask to take a bit of a nap in betweens. He participated in various concerts and album recording. His pockets were ample. But one corner of his heart was always empty. The hope that had not changed since sometime ago. Because of his strong desire to be in a band. 3년 뒤 기회가 찾아왔다. 다시 부활이었다. 2002년 함께 작업하던 이승철이 합류하며 자연스럽게 드럼을 맡을 수 있었다. 재회한 김태원의 표정은 밝았다. 그가 쓴 편지의 효력이었다. Three years after an opportunity found him. It was Boohwal again. 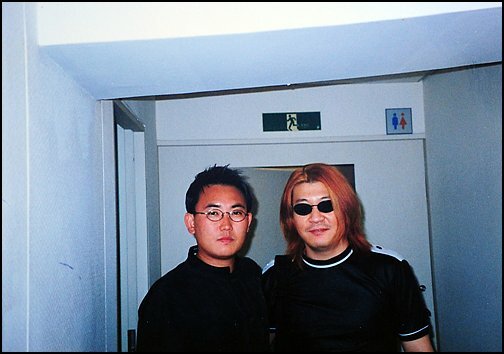 Lee Seung-Chul came to join Boohwal again for album recording in 2002, and Chae Jemin naturally came to play the drum again for the band. Kim Tae-Won’s expression when they met again was bright. It was the effect of the letter he wrote. 사실 채제민이 쓴 편지는 하나 더 있었다. 수신자는 이승환. 연유는 비슷했다. 밴드를 탈퇴하며 준 여운이었다. 뒤늦게 이 사실을 알게 된 김태원은 웃으며 말했다. [스타일기]부활 채제민② 이래뵈도 강변가요제 스타야. 스타! Article released 24 May 2010, 09.30 am. 1987년 채제민(왼쪽에서 두 번째)이 지하철역 안에서 티삼스 멤버들과 포즈를 취하고 있다. 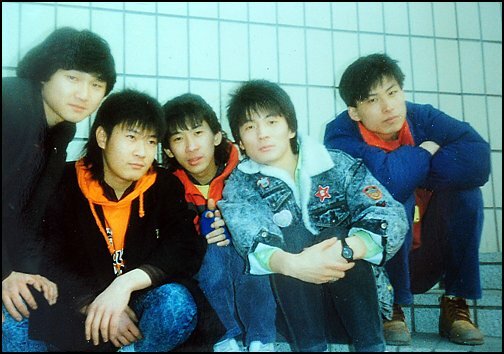 =Chae Jemin in 1987 (second from left), posing with the members of TISAMS in a subway station. 1980년대 MBC강변가요제는 수많은 히트곡을 남겼다. ‘J에게’, ‘젊음의 노트’, ‘담다디’…. 상을 거머쥔 노래들은 모두 그 해 최고의 곡으로 떠올랐다. In the 1980’s, a lot of hit songs came through MBC Gangbyeon Music Festival. J에게’, ‘젊음의 노트’, ‘담다디’… all the songs that brought the award home became the top song that year. 1987년은 동상을 받은 티삼스의 ‘매일 매일 기다려’도 그랬다. 당시는 드물었던 헤비메탈로 대중에게 큰 사랑을 받았다. 그것은 채제민이 드럼을 잡은 뒤 처음 맛본 달콤함이었다. So was “매일 매일 기다려” (I wait for you everyday) by Tisams, that won the 3rd prize in 1987. Back then, it was rare that a heavy metal band received such love from the public. That was the first sweetness Chae Jemin ever felt after he grabbed on a drum stick. 드럼을 접한 건 운명 같았다. 드럼을 연주하던 친구가 직업군인으로 입대하며 자리를 메워줄 것을 부탁했다. 기타와 드럼을 치며 노래하는 형들이 부러웠던 그는 얼떨결에 드럼스틱을 쥐었다. 복싱을 포기하고 만난 악기는 채제민에게 새로움으로 다가왔다. It was like destiny that he came to ‘touch’ a drum. His drummer friend went to enroll the military and asked him to fill in his empty spot. In his bewilderment and jealousy looking at the older guys playing the guitar, the drum, and singing, he picked up the drum stick. After giving up boxing, this musical instrument gave Chae Jemin a new feelings. 환경은 열악했다. 연습시간은 제한됐고 선생님은 없었다. 주어진 시간 내 독학이 불가피했다. 채제민은 정공법을 택했다. 운동했을 때와 같이 무작정 덤벼들었다. 해가 져도 끝까지 남아 연습을 강행했다. 이 때문에 집에 가는 마지막 버스를 잡으려고 늘 정류장까지 전력질주를 해야 했다. The environment was not supporting. There was limited time to practice and no one to teach. It was unavoidable he had to learn by himself in the given time. Chae Jemin chose the “regular tactics.” Just as when he was still doing sports, he had no definite plan. Even if the sun sets, he’d stay practicing till he drops. Because of this, he always had to (dead) run to the bus stop to catch the last bus home. 드럼 연주는 대학 입학 뒤에도 계속됐다. 그는 인하공업전문대학 토목학과에 입학했다. 토목에는 관심이 없었다. 학교를 택한 건 순전히 교내 헤비메탈 밴드 티삼스에 들어가기 위해서였다. 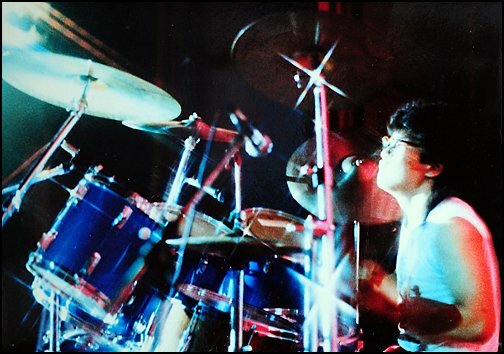 He kept on playing the drums after entering university. He entered the Department of Engineering in Inha Technical College. He had no interest in engineering. The reason he chose the school was simply to join the band “Tisams” in that university. 티삼스는 강변가요제를 계기로 인천을 대표하는 록그룹으로 떠올랐다. 채제민을 포함한 멤버들은 인기스타로 발돋움했다. 공연은 늘 대성황을 이뤘다. 여성 팬클럽이 생겼을 정도였다. Through Gangbyeon Music Festival, Tisams became the rock band’s representative from Incheon. Including Chae Jemin, Tisams members stepped on as popular stars. Their performance was always a big success, to a degree they could have had a (girls) fan club. 떠오른 위상은 가족들의 시선도 바꾸어놓았다. 음악을 반대했던 어머니는 곗돈으로 드럼을 선물했다. With the rise of their status (popularity),his family looked at him differently now. His mother who didn’t approve of him doing music bought him a drum with the money she borrowed from a credit union. 인기를 얻은 티삼스는 많은 음반사들의 표적이 됐다. 장고 끝에 아시아레코드사와 계약을 맺고 6개월 합숙에 들어갔다. 강변가요제에서 얻은 인기로 회사의 기대치는 상당했다. 소속 가수들 가운데 녹음실 사용은 늘 1순위였다. Gaining popularity, Tisams were targeted by many recording labels. After a long thought, they decided to sign a contract with Asia Records and entered their training dorm for 6 months. The company put a lot of hopes on the popularity they gained from Gangbyeon Music Festival. They were always prioritize to use the music studio among the singers in the company. 그러나 1988년 발표한 첫 번째 앨범의 반응은 실망스러웠다. 앨범 판매는 부진했고 방송국에서조차 불러주지 않았다. 지방공연을 전전하는데 그친 멤버들은 극심한 스트레스에 시달렸다. 경제적 소득마저 부진하자 팀은 자연스럽게 해체에 이르렀다. However, their first album released in 1988 gave a rather disappointing response. The albums were not sold out, but worse yet broadcasting stations didn’t even call (invite) them. They would sometimes have performance in local regions, yet the band members were suffering from extreme stress. Their income were really poor the team naturally broke up. 뿔뿔이 흩어진 티삼스 멤버들. 무대에서의 공연은 추억이 됐지만 우정은 아직도 그대로다. 가끔 술자리를 갖으며 추억을 회상한다. 보컬 김화수는 솔로가수로 데뷔했지만 소속사와의 갈등을 빚은 뒤 다른 인생을 살고 있다. 기타 신승호는 미국으로 이민을 떠났고 리더였던 조성욱은 저작권협회에서 일하며 음악학원을 운영한다. 오르간 안정모는 인터넷 사이트 스쿨뮤직 운영자로 채제민과 사업 파트너로 일하고 있다. Tisams members were scattered away. Their performance on the stage is now left a memory, but the friendship didn’t change. They sometimes have a drink together and reminisce. Although the vocalist Kim Hwa-Soo solo debut as a singer, he walked a different path after having difficulties with the recording company. Guitarist Sin Seung-Ho emigrated to the United States, and the former leader Jo Seong-Uk manages a music school while working in a Copyright Institution. Pianist An Jeong-Mo works side by side with Chae Jemin as partners running the “School Music” internet site. 대학 재학 시절 채제민(왼쪽)이 친구들과 작업실에서 기념사진 포즈를 취하고 있다. 1985년 봄, 인천의 한 복싱체육관. 샌드백 주변으로 사람들이 몰려들었다. 빠른 주먹과 현란한 몸놀림. 고등학생의 훈련에 구경꾼들은 이내 감탄사를 연발했다. 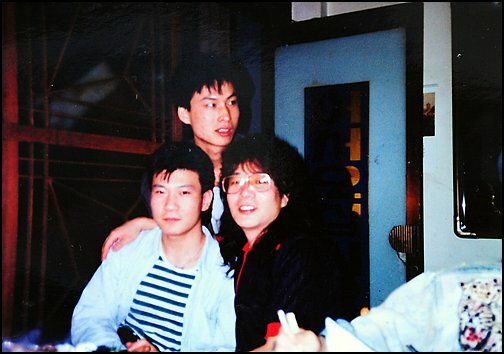 Spring 1985, a boxing training center in Incheon. People were gathering around a sandbag. Fast punches and brilliant body movements. The audience watching this high school boxing training was filled with admiration. 복싱이 최고 인기 스포츠였던 시절. 소년 채제민은 체육관 내 최고 스타였다. 나가는 대회마다 상의 주인이 됐다. 받은 트로피는 체육관 입구에 떡하니 걸렸다. 후배들은 이런 그를 살아있는 교과서로 여겼다. 그러나 오랜만에 체육관을 찾은 채제민은 동경 어린 시선이 달갑지 않았다. 남의 속도 모르는 찬사라고 생각했다. 기량이 이전과 비교해 현저히 떨어진 탓이었다. 많아지는 잡생각. 뻗는 주먹에서 집중력은 사라진 지 오래였다. The time when boxing was the most popular sport. Boy Chae Jemin was a star in the gymnasium. He owns every prize for all competitions he joined. The trophies he received was hung on the entrance to the gymnasium. Juniors thought of him as a living “textbook of boxing.” However, after sometime being absent, young Jemin didn’t find the gym satisfied him. 남의 속도 모르는 찬사라고 생각했다. He blamed it on his skills that wasn’t as remarkable as before. 많아지는 잡생각. For sometime, his concentration power had gone from his outstretched fist. 처음 복싱 글러브를 낀 건 중학생 때였다. 그는 다른 운동을 할 수도 있었다. 다양한 종목 체육부의 스카우트 대상이었기 때문이다. 큰 키와 넓은 어깨. 또래 친구들보다 두 배가량 큰 손은 어떤 운동에도 재목으로 보였다. He was in junior high when he first put his hands into boxing gloves. He could have also done other sports. It’s because he’s got a lot of scoutings for various fields of sports. Tall figure and wide shoulders. 또래 친구들보다 두 배가량 큰 손은 어떤 운동에도 재목으로 보였다. 처음 시작한 운동은 유도. 기량은 탁월했다. 그를 매트에 넘어뜨리는 또래 선수가 없을 정도였다. 그러나 시간이 흐를수록 시선은 자꾸 다른 곳을 향했다. 텔레비전에서 외국선수들을 통쾌하게 쓰러뜨리는 WBC 라이트 플라이급 챔피언 장정구처럼 복싱선수가 되고 싶었다. The first sport he ever started was judo. His was talented. There was almost no other athletes who could blow him down the mat. But as time went by, he started to look other direction. He wanted to become a boxer like the athlete he saw on TV blowing off his foreign opponent, the champion of WBC light play Jang Jeong-Gu. 긴 고민 끝에 찾은 복싱체육관. 관장과 선수들은 환영 일색이었다. 세계챔피언 감이라며 모두 함께 할 것을 제의했다. 다음 날 채제민은 매트 대신 링 위에 섰다. 글러브를 끼고 차근차근 세계챔피언의 꿈을 키워나갔다. 관장의 말처럼 실력은 일취월장했다. 짧은 훈련에도 불구하고 지역대회 상을 모두 휩쓸었다. After a long thought, he visited a boxing gym. The head of the gym and other athletes all welcomed him. 세계챔피언 감이라며 모두 함께 할 것을 제의했다. 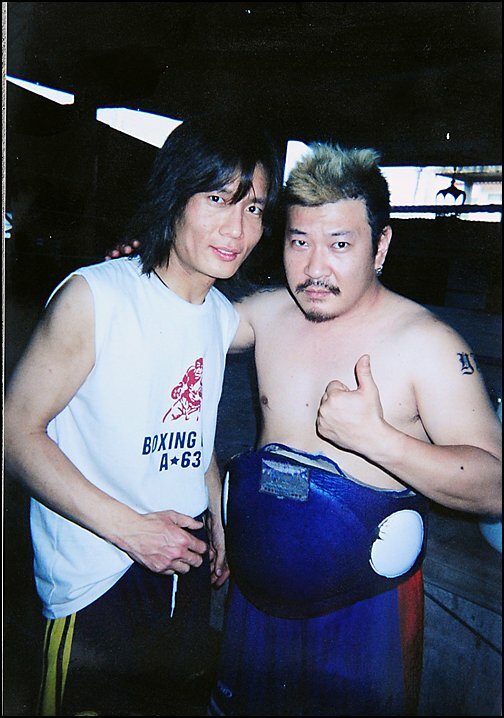 The next day, Chae Jemin was standing on the ring instead of a mat. 고등학생이 되면서 기량은 성인과 맞붙어도 될 정도로 탄탄해졌다. 그러나 멈출 줄 모르던 상승세는 2학년이 되면서 제동이 걸렸다. 아버지가 고혈압에 이은 중풍으로 세상을 떠났다. 아버지는 채제민을 유독 아꼈다. 어려운 형편에도 운동을 선택한 아들을 끊임없이 지원했다. As he enters high school, his skills progresses that he was srong enough to level a fight with adult boxer. But as he enters the second year of high school, right when he was progressing the most, he stumbled upon a braking stone. His father passed away from hypertension paralysis. His father loved Chae Jemin so much. Despite the difficult circumstances, he unendedly supported his son who chose to be an athlete. 아버지의 공백은 긴 방황으로 이어졌다. 링이 아닌 학교 안팎에서 주먹을 휘두르는 날이 많아졌다. 복싱으로 단련된 주먹에 상대는 매번 맥없이 쓰러졌다. 한바탕 소란 뒤 이들과 친구가 된 채제민은 자연스럽게 불량학생들의 우두머리로 떠올랐다. 계속된 불미스러운 사건들. 학교에 불려가던 어머니는 어느덧 경찰서를 드나들기 시작했다. The emptiness his father had left took him to a long wandering. The days when he’d throw about his fist in and outside school, instead of in the boxing ring, increased. Several times his opponents would pass out from meeting his boxing-trained fist. 한바탕 소란 뒤 이들과 친구가 된 채제민은 he naturally became the leader of the bad students. The unfavorable incidents. His mother was called to come to school often, and one day, she started to frequent to police station. 방황 끝에서 다시 찾은 체육관. 손에 낀 글러브는 낯설었다. 이전에 쏟은 열정은 찾아볼 수 없었다. 샌드백을 마주해도 소용없었다. 눈에 들어오는 건 전신거울에 비친 10kg이 불어난 몸뚱이뿐이었다. 관장은 체급을 올려서라도 강행할 것을 주문했다. 한 체급만 올려도 몇 배 더 고생해야하는 복싱. 세계챔피언의 꿈은 멀게만 느껴졌다. 채제민은 조용히 글러브를 벗고 가방을 짊어졌다. 허망하게 무너진 꿈. 그러나 표정은 어둡지만은 않았다. By the end of his wandering, he came back to the gym. It felt weird to put the gloves on again. The passion that he had before was no where to be found. It was no use even when he stood in front of a sandbag. All he saw was his reflection on the full-body mirror, his 10kg increased weight. 관장은 체급을 올려서라도 강행할 것을 주문했다. In boxing, you have to work manifold times harder even if you only step up one weight class. He only felt the dream to become the world champion slipping away. Chae Jemin took off his gloves quitely and packed his bag. A dream that ended in vain. But it wasn’t only darkness in his expression. 멀어지는 체육관에서 얻은 교훈. 그것은 이후 새로운 꿈을 쫒는 발판이 됐다. 바로 음악이었다. A lesson he learned from the gym that he had departed. It became a stepping stone when he went to follow his new dream. It was music. 고등학교를 갓 졸업한 채제민이 연주발표회에서 드럼을 치고 있다.